Start your New Year on a sweet high with keto cannabis pancakes. Yes, you read that right: keto cannabis pancakes, and they slay; also, good fortitude after a heavy night of celebrations. I went to bed at 4am to the sound of bad disco music being pumped out of cheap speakers from a nearby plaza, woke up late, and made this for lunch. Now, there’s a chorus of birdsong outside my house, the perfect soundtrack to sunset on New Year’s Day. 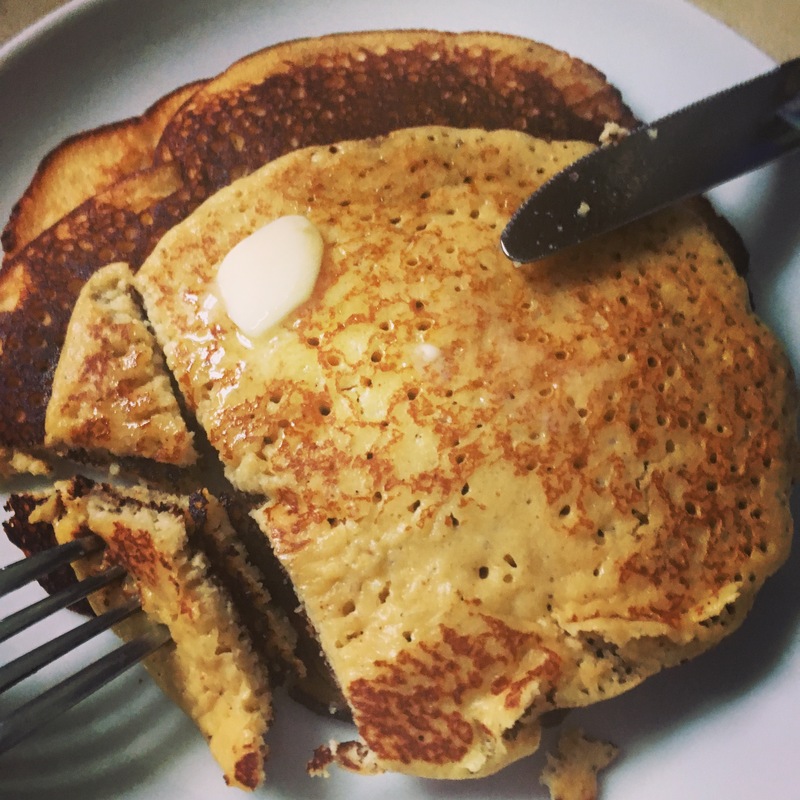 Making batter-type foods like pancakes into workable keto recipes is challenging because flour substitutes like almond and coconut don’t create the same creamy texture when blended as plain flour. I’ve made a bunch of keto pancake recipes in the past that had the consistency of lumpy paint and fell apart in the pan. This recipe gets around that problem by creating a good batter base first using cream cheese and cream, and adding the almond flour last. I amended the original recipe to include cannabutter, but it works really well with these flavours. As you bite in, first you taste the cream and cheese, vanilla next, followed by nutmeg and the nutty tang of cannabutter. Then the whole lot has a party in your mouth that lasts hours. FYI Do expect your kitchen to smell like a donut factory. These pancakes are American-style but a keto cannabis crepe recipe is coming soon. Put the cream cheese and cannabutter in a double boiler, and melt. Mix it very well, until creamy, and remove from heat. Add cream, and blend. Add eggs, vanilla extract, and 1 tablespoon of maple syrup, and blend. Add the dry ingredients, almond flour, nutmeg, baking powder, and salt. Better to add half the flour first and check the consistency of your batter, then add more as needed. If the batter is too watery, add more flour. If it’s too thick, add more cream. Heat a non-stick pan, grease it with butter, and pour batter in batter, just enough for one pancake. As it cooks on the bottom, cover it with a lid. Let it cook for about 3 to 4 minutes, and flip it with a spatula. Cook for about a minute on the other side, and repeat. This recipe makes 6 pancakes. Serve hot, with melted butter and the remaining maple syrup. It would be possible to add cannabutter to the finished pancakes if you want to get blitzed, but this recipe is a more than enough to ease you gently into 2019. Wishing you a Happy and High 2019, my freaky friends.